I could go on ad infinitum, ad nauseum. A good leader should constantly be mindful of two circles (one inside the other) – the vision circle and the resources circle – and how your vision should always determine the focus and intensity of the resources circle. Vision is always larger. Pastors usually have tons of vision. Ask them about their vision and they should be able to spout “vision” all day and night. The needle for vision is often past the F on the tank of a pastor’s heart. But vision is also cheap. It doesn’t cost anything to think of what you want to be, where you want to go or what you want to do. Resources? Well, that’s another story. Resources by definition are limited. And for some who are beginning a new congregation, “limited” can be putting it modestly. I would guess planters are limited in time, money and people probably more in the seminal years of the church than any other season. That’s why it’s critical to understand the two circles very early in the game. Think of your vision as the bigger outer circle (and really the furthest edge of the circle is our concern) and your current resources as the inner circle. [See fig. 1] In a perfect world our resource circle matches, if not exceeds, the size of the vision circle. If we see it we can do it. Ah, what a nice world in which to live! When you arrive tell me how it feels because I’m nowhere close. I don’t think any of us are. Most of us have ever-increasing vision. Our resources, on the other hand, for the most part are fixed in size. Yes, we want them to grow and hopefully they will but it’s so incremental that for all intents and purposes the inner circle we draw is normally much smaller. 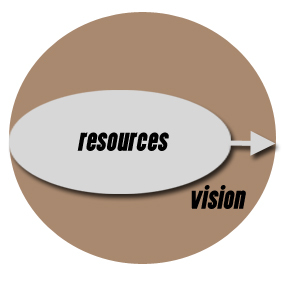 Question: What happens to your resources as you try to move them toward your vision? The circle flattens out a bit – more oval than circle. 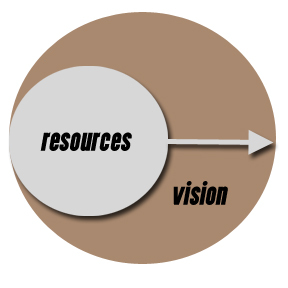 This should help us see that in order for us to “resource the vision” other things which don’t serve your particular vision (possibly new ministries, additional but not essential staff, etc.) may need to be taken off the table financially speaking. This sometimes tough leadership call is critical or you’ll find yourself throwing time, money and people at distracting endeavors that will keep you from meeting your vision. You may be doing a lot of things as a result, but rarely will you be doing the best things – things that move you down the road toward your vision. In the end you wind up with the same circle you began with because it’s stretching toward every direction trying to meet everyone else’s passion, focus and vision. The most effective churches I know are led by those who work hard at moving the resource circle to the right vision and fighting off attempts to do anything less. Know your vision. Know your vision. Know your vision. If you can’t articulate your vision in a heart-inspiring, troop-rallying, dig-in-for-the-long-haul fashion, you better fix that quickly! If you didn’t learn this in Church Planting 101 you may need to go back to school. Seriously, if you need help you might check out Acts 29 Network. These guys are solid. Learn to say “No” early and often. You don’t have to be a jerk but you do have to be “graciously tenacious” in redirecting the gaze of those you lead to better paths. This is where your ability to communicate the vision will come in handy! It takes hard work to shepherd (and not manipulate or domineer, cf., 2 Cor. 1:24) people to your spot on the vision circle. Work at enlarging the resource circle. Teach giving early and with regularity. Don’t be apologetic or embarrassed when you’re in the pulpit. It’s biblical. Get over it. If you can’t muster the courage, don’t complain when your resource circle hasn’t kept up with the congregation’s spiritual growth in other areas. I appeal to you that it is for Western Christians just as much about discipleship as anything else. Regularly evaluate how you’ve done. Does your spending overlap well with your vision? Have the financial, staffing and other leadership decisions you’ve made recently stretched the resource circle or pulled it back to its ineffective roundness in an attempt to meet additional (read:lesser) visions? Ask the hard questions. Get the brutal facts. Then, like a great football team at halftime, make the right adjustments. Good stuff here buddy. Church planting has been a wild ride…challenging everything I thought I knew about church. Thanks for your insights. For those “lurkers” to my blog from around the nation, I see you (thanks Sitemeter). If you want to see a church plant gone well check out Barosh’s congregation! Great thing going on due to God working through some great leadership!